Rasmus "Caps" Winther of G2 Esports has been named Most Valuable Player of the League of Legends European Championship spring split 2019. G2 Esports were the most dominant team of the European spring split, with an overall win-loss record of 13-5. The few losses incurred mainly in the last weeks of the split after G2 had secured their first seed and were fielding substitute Hampus "PromisQ" Mikael Abrahamsson. Throughout that period of dominance, Caps stood out as the star mid laner on multiple champion picks from Irelia-to-Akali-to-Zoe. The young superstar leaving Fnatic to join G2 was the most unexpected and talked-about roster change during the offseason. Caps and G2 Esports are currently awaiting in the LEC's spring finals to face either Origen or Fnatic, per the new format. Caps has continued his spectacular form on G2 and is looking to win his third domestic championship. This is Caps' second MVP award after receiving the accolade while on Fnatic during the EU LCS summer split 2018. 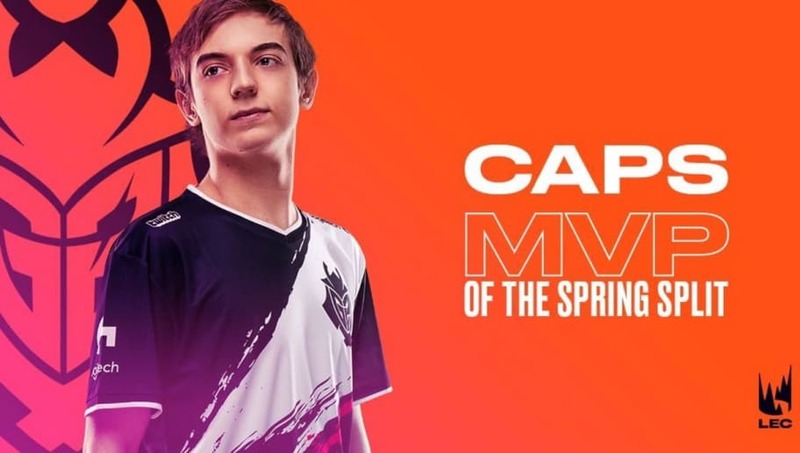 Caps is the first MVP of the re-branded LEC and the third to be named European split MVP more than once. With this, Caps is tied with Gang-yun "Trick" Kim and behind only former teammate Martin "Rekkles" Larsson, who holds three MVP awards to Caps' and Trick's two. Caps is also on the 1st All-Pro Team for the LEC spring split, alongside G2 teammates Mihael "Mikyx" Mehle and Marcin "Jankos" Jankowski and Team Vitality's Lucas "Cabochard" Simon-Meslet and Splyce's Kasper "Kobbe" Kobberup. Rookie of the Split was awarded to Oskar "Selfmade" Boderek of SK Gaming. Coach of the Split was awarded to André "Guilhoto" Guilhoto of Origen. The LEC semifinal and final will take place this weekend, April 13-14 at the Ahoy Arena in Rotterdam, the Netherlands. The victor will earn 80 thousand euros, 90 championship points for Worlds 2019 and an invitation to the Mid-Season Invitational 2019.